We take a fresh inspiring approach to opera to reflect the diversity of our culture. 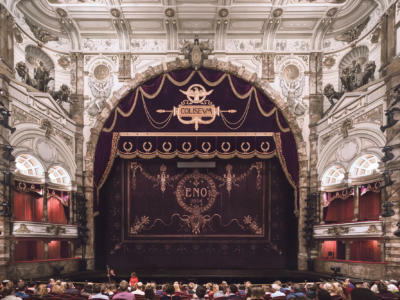 At ENO, we believe that opera is a living art form able to connect to people from all parts of our society. We collaborate with a range of artists and art forms to deliver different aspects of the repertoire, from baroque to contemporary, as well as commissioning new works as part of our commitment to the future of the art form. We believe that singing in English enhances the emotional connection between performers and audiences. We encourage creativity throughout the company and our commitment to the future of opera provides a platform to develop outstanding careers. We are a world-class national company recognised internationally for the standard of our work. and proactively provide a platform for young singers to start and then develop global careers. We connect to audiences through inspiring, accessible, world-class opera and stimulating, creative participation programmes. We create our productions for the widest possible audiences and aim to introduce completely new audiences to the magic of opera whether at the London Coliseum, outside of our theatrical home or internationally. and our ENO Baylis learning and participation programmes. We work with a wide range of visiting companies to generate essential revenue and welcome new audiences to share the experience of our theatre.